Background: Left ventricular (LV) hypertrophy is considered to be a significant manifestation of increased blood pressure, which is associated with an increased risk of cardiovascular morbidity and mortality. Exercise training is recommended for reducing blood pressure in mild and moderate hypertensive patients. Methods: We conducted a search for interventional studies evaluating the effect of exercise on LV mass index (LVMI) in hypertensive patients. Studies were searched using different databases from 1990 to 2015. The primary end points were change in LVMI, systolic blood pressure (SBP), and diastolic blood pressure (DBP). Of 122 studies, eight studies were found to be eligible for this meta-analysis. Results: The produced effect size was found to be large for LVMI (3.6, 95% confidence interval [CI]: 1.7–5.5) and DBP (2.8, 95% CI: 1.6–3.9) with significant heterogeneity, while moderate (0.56, 95% CI: 0.35–0.77) for SBP without significant heterogeneity. The estimated predictive intervals for LVMI (95% CI: −3.2–10.3) and DBP (95% CI: −1.3–6.8) showed a positive but not significant difference in the intervention and control groups. Conclusion: The study demonstrated a significant reduction in LVMI and DBP in hypertensive patients after exercise training. A moderate reduction in the SBP of these patients was also depicted after exercise. Our study supports the American College of Cardiology/American Heart Association guidelines for regular exercise in hypertension. Hypertension is considered one of the most common medical conditions seen in multiple medical specialties. It has been established as one of the major risk factors for cardiovascular disease. According to the Centers for Disease Control and Prevention, the percentage of adults (aged 20 years or older) with hypertension in 2013–2014 is estimated to be 33.5%. Left ventricular (LV) hypertrophy is considered to be a significant manifestation of increased blood pressure that is associated with an increased risk of cardiovascular morbidity and mortality. Pathophysiologically, hypertrophy is related to increased workload of the heart due to pressure overload secondary to hypertension and/or valvular diseases. There is also a strong intrinsic association between hypertrophy of the LV and cardiomyopathy. Another theory suggests that hypertrophy may be involved in the remodeling process of the heart muscle following acute myocardial infarction and congestive heart failure (CHF). In general, increased afterload in hypertensive patients leads to myocyte hypertrophy and collagen formation with the end result of fibrous tissue formation. It has been reported that LV hypertrophy is an independent risk factor of future cardiovascular complications., Furthermore, it has been observed that lowering blood pressure reduces LV hypertrophy.,,, A number of studies have evaluated the regression of LV hypertrophy by pharmacological and nonpharmacological strategies that lower the blood pressure. Among nonpharmacological strategies, lifestyle interventions, such as exercise training, are recommended for reducing blood pressure in mild and moderate hypertensive patients. However, there are conflicting findings reported on the effect of exercise intervention to reduce LV hypertrophy. Hinderliter et al. conducted a randomized controlled trial which concluded that exercise and weight loss in overweight sedentary men and women lead to reduced blood pressure and induced positive outcome in LV structure. Kokkinos et al. demonstrated blood pressure reduction and decreased LV hypertrophy in severe hypertension in African-Americans who underwent moderately intense aerobic exercise training. Other studies have reported conflicting results.,,, Under normal conditions, normotensive individuals undergoing aerobic exercise were noted to have an increase in the end diastolic dimension of the LV and subsequent increase in the wall thickness. LV hypertrophy can be diagnosed through different means. In particular, transthoracic echocardiography is considered an accurate diagnostic modality. It can provide information regarding the interventricular septum, posterior LV wall thickness, and LV diameter during diastole. All these measures can be used to calculate the LV mass index (LVMI) by dividing the LV mass by the body surface area, helping to predict future complications. There are multiple meta-analyses available for providing the dose–response relationship of exercise on coronary heart disease (CHD) and CHF., These are important hard-end points, especially if exercise improves the LVMI. This aids our understanding behind the pathophysiology of CHD and CHF and more importantly, the decreases in the prevalence of these two conditions. Therefore, in this study, we conducted a meta-analysis to evaluate the overall effect of exercise on LVMI and blood pressures in hypertensive patients. We systematically searched any interventional studies evaluating the effect of exercise on LVMI in hypertensive patients. Studies were searched using PubMed, EMBASE, and Google Scholar databases with search terms “exercise or physical training or life style or physical activity” AND “left ventricular mass or LVMI or left ventricular or hypertrophy” AND “hypertension or blood pressure or hypertensive.” In addition, full-statement terms such as “effect of exercise or physical activity on LVMI in hypertension or blood pressure” were also used for searching articles. Online abstracts published as proceedings were also included in the search. Two independent investigators produced electronic database searches (AS and MT). In cases of conflicting findings, consensus was found by including a third investigator (AD). Only prospective interventional studies published between 1990 and 2015, conducted on humans age 19 or older, based on hypertensive patients, “mild or moderate,” and written in English, were included in the meta-analysis. Articles based on animal studies were excluded. This process is outlined in [Figure 1]. The Preferred Reporting Items for Systematic Reviews and Meta-Analyses guidelines were followed for conducting this meta-analysis. We critically evaluated the risk of bias of each study using the Methodological Index for Non-Randomized Studies (MINORS). MINORS is an excellent instrument for assessing the risk of bias of interventional studies. It consists of 12 methodological items and provides a global ideal score of 24 for comparative studies. The primary end points were change in LVMI, systolic blood pressure (SBP), and diastolic blood pressure (DBP). Two independent investigators extracted data on year of publication, sample size in each study arm, and study primary end points such as preintervention average LVMI, SBP, and DBP, and their standard deviations (SDs), postintervention average LVMI, SBP, and DBP, and their respective SDs in each intervention and control group. Additional data related with demographics or clinical characteristics were also recorded. 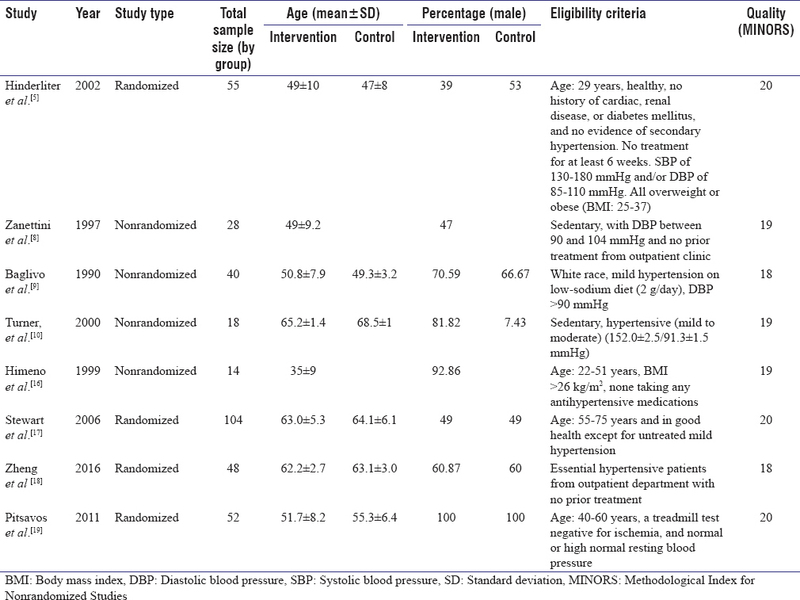 Sample size, mean, and SD of each outcome at baseline and after intervention for each group separately (intervention and control) from the published studies were recorded in an Excel spreadsheet. The mean changes in the outcomes and pooled SD were computed using the formula. Furthermore, standardized mean difference (SMD) between changes in the outcome between intervention and control groups was estimated for each study. Inverse variance weight was computed for each study to generate a pooled estimate. Inverse variance weight allocates more weight to larger studies. After computing mean difference, SMD, standard error (SE), and weights of each outcome for each study, the heterogeneity (I2 statistic) in the studies was evaluated and considered to be significant if I2 statistic >75%. In the absence of significant heterogeneity (I2< 75%), a fixed-effect model was used to estimate the pooled effect size while a random effects model was used in the presence of heterogeneity. The pooled effect size was summarized using mean changes or SMD along with their 95% confidence interval (CI) and P value. P < 0.05 was considered statistically significant. In the presence of heterogeneity, predictive interval of the effect size was also estimated. Various sensitivity analyses were conducted to explore the impact of study characteristics and causes of heterogeneity. In addition, potential publication bias was also assessed using Begg's test and a funnel plot for each outcome separately. In the presence of publication bias, a cumulative meta-analysis was conducted to determine the threshold for large sample size. Restricted meta-analyses for large sample size studies were carried out to validate the findings of the study. All the statistical analyses were carried out using Stata 12.1 (StataCorp LP, College Station, TX 77845, USA). The electronic database search yielded a total of 122 articles. 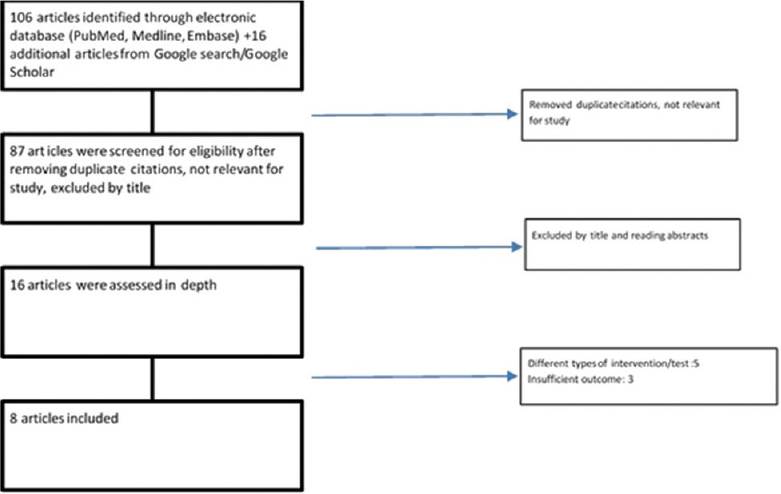 Identification of suitable articles eligible for the study is reported in a flow chart [Figure 1]. Of 122 studies, 8 studies were found to be eligible for this meta-analysis. Of these, one study by Hinderliter et al. yielded two datasets for analysis. A total of nine datasets were included in the analysis. The characteristics of individual studies are presented in [Table 1]. Four studies were randomized studies and the other four studies were prospective nonrandomized studies. Six studies included a parallel control group while preintervention data served as controls in two studies (pre-post design). All the included studies were of high quality (MINORS score ≥18). The average age of the patients in different studies varied from 49 to 65 years except for one study where the patients' average age was 35 years. One study was only based on male patients. The eligibility criteria of each study were found to be similar except for a few conditions. Three studies were based on overweight or obese individuals. Hinderliter et al. provided LVMI data on g/m 2, Himeno et al. provided LVMI data on g/m and other studies reported LVMI using g/m 2., The baseline range of average LVMI was found to be 101–138.7 except in two studies (range: 47.8–63.6). In the intervention group, a significant reduction in LVMI, SBP, and DBP was observed, while no changes in LVMI and DBP were observed in control group [Table 2]. However, a trend toward significant reduction in SBP was also observed in control group. When we excluded a study which used low-sodium diet as control, no change in SBP was observed (0.79, 95% CI: -7.9-9.4). More than 5 unit change (a clinically significant level) in each outcome was observed after exercise intervention. In the intervention group, a significant heterogeneity (I2= 91.5%) in the effect of intervention was only observed for LVMI outcome. To explore the effect of study characteristics and cause of heterogeneity of the intervention effect, various sensitivity analyses were carried out and are reported in [Table 2] and [Table 3]. The pooled effect size (mean difference) did not change much after excluding a study which used exercise along with low-sodium diet intervention. A significant reduction in heterogeneity (I2= 45.1%) of the intervention effect was observed after excluding studies which included obese individuals. Two studies (yielding three data sets) had very different average LVMI values than any other studies. After excluding such studies, the effect of exercise intervention was observed as 13.5 (95% CI: 11.8–15.3) with no significant heterogeneity (I2= 36.4%). The effect of exercise intervention on SBP and DBP was increased after excluding studies which were based on obese individuals. The overall effect (SMD) of exercise intervention compared to the control group was found to be significant for all outcomes [Table 4]. The produced effect size was found to be large for LVMI (SMD: 3.6, 95% CI: 1.7–5.5, I2= 97.5%) and DBP (SMD: 2.8, 95% CI: 1.6–3.9, I2= 94.0%) with significant heterogeneity while moderate (0.56, 95% CI: 0.35–0.77, I2= 63.4%) for SBP without significant heterogeneity. The estimated predictive intervals for LVMI [95% CI: 3.2–10.3, [Figure 2] and DBP (95% CI: 1.3–6.8) showed a positive but not significant difference in the intervention and control groups. After excluding studies which were based on obese individuals or used a low-sodium diet, a large effect [SMD: 7.3, 95% CI: 6.3–8.33, [Figure 3] of exercise intervention was observed without significant heterogeneity (I2= 67.1%). There was evidence for publication bias using Begg's test and funnel plot for each outcome (LVMI, Begg's test: P = 0.05; SBP, Begg's test: P = 0.024; and DBP, Begg's test: P = 0.015). Cumulative meta-analysis showed that the studies ≥48 sample size could be considered as large studies. Restricting analysis to large studies (sample size ≥48, n = 5) produced significant pooled effect size for LVMI (SMD: 2.68, 95% CI: 0.62–4.74, P = 0.011), SBP (SMD: 0.43, 95% CI: 0.20–0.66, P ≤ 0.001), and DBP (SMD: 2.11, 95% CI: 0.98–3.24, P ≤ 0.001) without any significant publication bias. The utility of nonpharmacologic interventions such as exercise has been documented for reducing blood pressure. However, whether such reduction in blood pressure ameliorates LVMI is not clear, especially in hypertensive patients. It is also possible that exercise may attenuate the favorable effect of blood pressure reductions by increasing the LVMI in hypertensive patients. To address this critical question, we conducted a meta-analysis to examine the pooled exercise effect on LVMI and blood pressures in hypertensive patients. We found that the exercise intervention not only reduces SBP and DBP but also provides beneficial effects on LVMI. A significant reduction in LVMI was found in the exercise group compared to control group. The effect was more pronounced in the subgroup of studies which were not based on obese individuals and did not use low-sodium diets in the control group. There was a reduction in LVMI after exercise in all studies except the Stewart et al's. and Hinderliter et al's. studies. Interestingly, the LVMI measurements of the patients from the Hinderliter et al's. and Stewart et al's. studies were noticeably lower in value when compared to other studies. The primary reason could be that the patients in these studies were overweight and obese. In the Hinderliter et al. 's study, LVMI was calculated by dividing grams by body surface to the 2.7th power as opposed to majority of the other studies which used grams divided by body surface area to the 2nd power., The overall effect of exercise intervention on LVMI was found to be very large without significant heterogeneity after excluding studies which were based on obese individuals or used low-sodium diet as a control group. When analyzing the SBP measurements of the patients, a significant reduction was obtained in all studies after exercise intervention. Of note, a reduction in SBP was also observed among the individuals in the control group. Upon excluding Baglivo et al's. study which used a low-sodium diet as a control group, there were no changes in SBP measurements among the controls. Compared to the large effect of exercise on LVMI, a moderate effect on SBP was depicted. However, exercise did appear to exert a larger effect on DBP. A significant decrease in DBP was observed in individuals when measurements were taken after the exercise regimen. In concordance to other studies, our study confirms that the exercise intervention reduces blood pressures (both SBP and DBP measurements) compared to controls in hypertensive patients. The beneficial effects of an exercise intervention were also obtained for each outcome after restricting analysis to large studies only. This further confirms that there is a potential effect of exercise intervention in hypertensive patients. The participants in our selected studies underwent various exercise regimens but were not subjected to the high-intensity training of athletes. This is important because there is a distinction between the cardiac size and function of athletes and our study participants. In athletes, high-intensity exercise and endurance training of prolonged duration have been shown to increase LV dimensions. The heart's response to such stimuli is a physiologic adaptation that does not signify any pathological process. In addition, this LV hypertrophy triggered by exercise will readily regress with the cessation of exercise and conditioning. In contrast, hypertension-induced LV hypertrophy is a pathological change associated with an adverse prognosis. While our review suggests a decrease of LVMI, SBP, and DBP in participants in the exercise groups, the exact mechanisms of this regression are unclear. Enzymes involved in the renin–angiotensin–aldosterone system and catecholamines are believed to play a role. Autonomic nervous system abnormalities have also been implicated in cardiac remodeling. Chronic aerobic exercise training has been shown to lower basal catecholamine levels and resting heart rate,, along with reducing SBP by 5–10 mmHg. In addition, pharmacotherapy in concert with exercise training has been shown to promote myocardial capillarization. These changes promote a decrease in cardiac afterload, diminishing the impetus for concentric remodeling. There are meta-analyses which suggest that exercise intervention reduces the risk of CHD, CHF, and cardiovascular disease.,, Our study yields a probable mechanism to explain the findings of these meta-analyses. Our study supports that exercise intervention in hypertensive patients reduces blood pressure and subsequently improves the LVMI which might help in minimizing end-organ damage and reducing cardiovascular events such as CHD and CHF. It seems that exercise may not produce favorable change in LVMI among obese individuals. The primary limitation of this meta-analysis study is the relatively small sample size. Our study was based on only eight published studies and these studies were based on small sample sizes themselves. Furthermore, in view of small number of studies, we did not solely utilize randomized controlled studies to conduct this meta-analysis. To our knowledge, this is the first meta-analysis study evaluating the effect of nonpharmacologic intervention (aerobic exercise training) on LVMI and blood pressures among hypertensive patients. The data from our meta-analysis and review demonstrate a significant reduction in LVMI and DBP in hypertensive patients after an exercise regimen. A moderate reduction in the SBP of these patients was also depicted after the exercise. Our study supports a theory that exercise will reduce LVMI. Aerobic exercise is already a well-established component of lifestyle modifications in terms of hypertension management. As LV hypertrophy has been associated with an increase in cardiovascular morbidity and mortality, there may be scope for the incorporation of LVMI measurement to initially forecast cardiovascular outcomes in patients diagnosed with hypertension and to gauge their response to management plans. In addition, clinicians would be better able to risk stratify hypertensive patients using LVMI as one of the several criteria in order to personalize treatment and management. Given the significant amount of heterogeneity, a large randomized clinical trial is needed to confirm the effect of exercise intervention on LVMI outcome. Go AS, Mozaffarian D, Roger VL, Benjamin EJ, Berry JD, Borden WB, et al. Heart disease and stroke statistics – 2013 update: A report from the American Heart Association. Circulation 2013;127:e6-245. Kahan T, Bergfeldt L. Left ventricular hypertrophy in hypertension: Its arrhythmogenic potential. Heart 2005;91:250-6. Hinderliter A, Sherwood A, Gullette EC, Babyak M, Waugh R, Georgiades A, et al. Reduction of left ventricular hypertrophy after exercise and weight loss in overweight patients with mild hypertension. Arch Intern Med 2002;162:1333-9. Kokkinos PF, Narayan P, Colleran JA, Pittaras A, Notargiacomo A, Reda D, et al. Effects of regular exercise on blood pressure and left ventricular hypertrophy in African-American men with severe hypertension. N Engl J Med 1995;333:1462-7. Reid CM, Dart AM, Dewar EM, Jennings GL. Interactions between the effects of exercise and weight loss on risk factors, cardiovascular haemodynamics and left ventricular structure in overweight subjects. J Hypertens 1994;12:291-301. Zanettini R, Bettega D, Agostoni O, Ballestra B, del Rosso G, di Michele R, et al. Exercise training in mild hypertension: Effects on blood pressure, left ventricular mass and coagulation factor VII and fibrinogen. Cardiology 1997;88:468-73. Baglivo HP, Fabregues G, Burrieza H, Esper RC, Talarico M, Esper RJ, et al. Effect of moderate physical training on left ventricular mass in mild hypertensive persons. Hypertension 1990;15:I153-6. Turner MJ, Spina RJ, Kohrt WM, Ehsani AA. Effect of endurance exercise training on left ventricular size and remodeling in older adults with hypertension. J Gerontol A Biol Sci Med Sci 2000;55:M245-51. Sattelmair J, Pertman J, Ding EL, Kohl HW 3rd, Haskell W, Lee IM, et al. Dose response between physical activity and risk of coronary heart disease: A meta-analysis. Circulation 2011;124:789-95. Pandey A, Garg S, Khunger M, Darden D, Ayers C, Kumbhani DJ, et al. Dose-response relationship between physical activity and risk of heart failure: A Meta-analysis. Circulation 2015;132:1786-94. Slim K, Nini E, Forestier D, Kwiatkowski F, Panis Y, Chipponi J, et al. Methodological index for non-randomized studies (minors): Development and validation of a new instrument. ANZ J Surg 2003;73:712-6. Morris SB, DeShon RP. Combining effect size estimates in meta-analysis with repeated measures and independent-groups designs. Psychol Methods 2002;7:105-25. Himeno E, Nishino K, Okazaki T, Nanri H, Ikeda M. A weight reduction and weight maintenance program with long-lasting improvement in left ventricular mass and blood pressure. Am J Hypertens 1999;12:682-90. Stewart KJ, Ouyang P, Bacher AC, Lima S, Shapiro EP. Exercise effects on cardiac size and left ventricular diastolic function: Relationships to changes in fitness, fatness, blood pressure and insulin resistance. Heart 2006;92:893-8. Zheng H, Xie N, Xu H, Huang J, Xie X, Luo M, et al. Effects of 4 month exercise on left ventricular remodeling and autonomic nervous system in hypertensive patients. Panminerva Med 2016;58:1-7. Pitsavos C, Chrysohoou C, Koutroumbi M, Aggeli C, Kourlaba G, Panagiotakos D, et al. The impact of moderate aerobic physical training on left ventricular mass, exercise capacity and blood pressure response during treadmill testing in borderline and mildly hypertensive males. Hellenic J Cardiol 2011;52:6-14. Martin WH 3rd, Coyle EF, Bloomfield SA, Ehsani AA. Effects of physical deconditioning after intense endurance training on left ventricular dimensions and stroke volume. J Am Coll Cardiol 1986;7:982-9. Smith VE, Schulman P, Karimeddini MK, White WB, Meeran MK, Katz AM, et al. Rapid ventricular filling in left ventricular hypertrophy: II. Pathologic hypertrophy. J Am Coll Cardiol 1985;5:869-74. MacDonald JR. Potential causes, mechanisms, and implications of post exercise hypotension. J Hum Hypertens 2002;16:225-36. Cléroux J, Feldman RD, Petrella RJ. Lifestyle modifications to prevent and control hypertension 4. Recommendations on physical exercise training. Canadian Hypertension Society, Canadian Coalition for High Blood Pressure Prevention and Control, Laboratory Centre for Disease Control at Health Canada, Heart and Stroke Foundation of Canada. CMAJ 1999;160:S21-8. Johnson EJ, Dieter BP, Marsh SA. Evidence for distinct effects of exercise in different cardiac hypertrophic disorders. Life Sci 2015;123:100-6. Li J, Siegrist J. Physical activity and risk of cardiovascular disease – A meta-analysis of prospective cohort studies. Int J Environ Res Public Health 2012;9:391-407.